SafetyLink’s patented surface mounted FrogLink has set a new benchmark in the field of height safety. This revolutionary all in one unit has been designed to attach to all metal profiles with a single row of attachment holes. This unique configuration makes it a fast simple unit for installation. A height safety anchor point for use on metal roofs where access to timber is difficult will arrest from any direction. 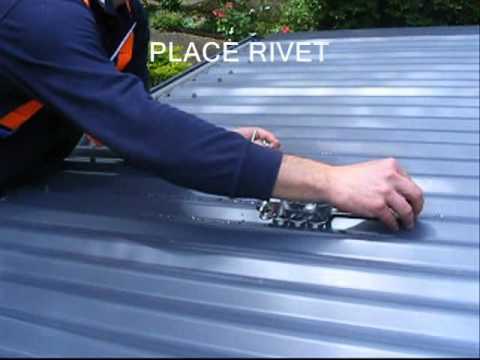 Designed to suit all roof profiles with a single row of holes for the rivets. Install using 7 x Gesipa Bulbtite Rivets, RV6605-9-6W (Drill Size 7.8-8.2mm, 27.7mm length, 1.0-9.5mm grip range, Aluminium). Single person anchor, rated at 15kN. Its low profile reflective design is a plus for any commercial or residential enterprise wanting to maintain an aesthetically pleasing façade. The FrogLink doesn't just look good; its dynamic design reduces the load back onto the structure and person attached to the anchor. The FrogLink™ is rated to 15kN, tested and manufactured in accordance with Australia and New Zealand Standard AS/NZS 1891.4 and European BS EN 795:2012, CEN/TS 16415:2013.